Walking House is a result of a project started by the Wysing Arts Centre of Cambridgeshire. The intent was to create structures that would move at a slow pace, no faster than the walking pace of a human being. These structures would imitate traditional Romani horse carriages from the eighteenth century and support their nomadic culture and values. WALKING HOUSE is a modular dwelling system that enables persons to live a peaceful nomadic life, moving slowly through the landscape or cityscape with minimal impact on the environment. It collects energy from its surroundings using solar cells and small windmills. There is a system for collecting rain water and a system for solar heated hot water. A small greenhouse unit can be added to the basic living module, to provide a substantial part of the food needed by the Inhabitants. A composting toilet system allows sewage produced by the inhabitants to be disposed of. A small wood burning stove could be added to provide CO2 neutral heating. WALKING HOUSE forms various sizes of communities or WALKING VILLAGES when more units are added together. WALKING HOUSE is not dependant on existing infrastructure like roads, but moves on all sorts of terrain. 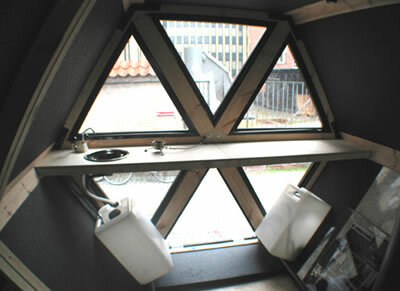 From Walking House: Manual for micro dwellings and CleanTechnica.